Today's guest post comes atcha from one of my personal favorites. Kelly McNelis is a psychologist-turned-blogger for New Leaf Wellness. She lives in Pittsburgh, PA with her husband and three young daughters, and makes most of her money selling cookbooks—which are awesome. I referenced them a ton when I was prepping freezer meals. So naturally, I'm excited that she agreed to write up a new recipe for all of you. Prep your slow cookers! Many people associate slow cookers ("crockpots") with heavy recipes full of cream-based condensed soups. I'm here to tell you that those days are over. If you want to make healthy cooking easy, your slow cooker is your best friend. 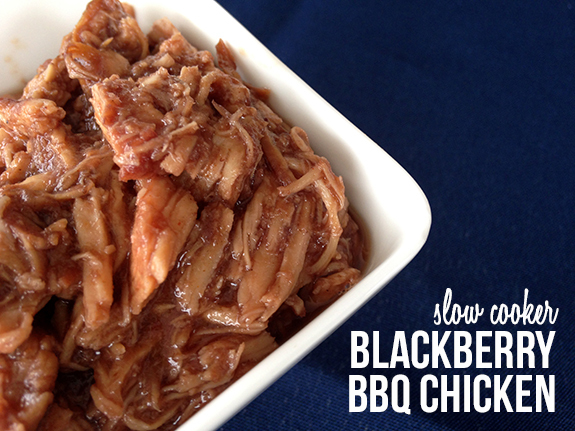 Take this slow cooker blackberry BBQ chicken, for example. It's made with a lean meat and it's low fat. It's also sweet, delicious, and so easy to make! I have three young daughters (ages four and under) and work part-time blogging for New Leaf Wellness. Prepping an easy slow cooker recipe in the morning means I can forget about dinner and take my daughters to the mall or park instead. In the winter, I make a lot of slow cooker soup and chili recipes, and when summer rolls around I turn to slow cooker Hawaiian chicken and shredded barbecue chicken. This slow cooker blackberry BBQ chicken is the perfect addition to your summer recipe rotation. The blackberry BBQ sauce is sweet and spicy and it makes this recipe more special than your average BBQ chicken. Make it on a day when you don't feel like grilling and don't want to heat up your kitchen by turning on your oven. 1) Add chicken breasts to your slow cooker. 2) In a medium-sized bowl, create sauce by adding blackberry jam, BBQ sauce, and ground cayenne pepper. Stir to combine. 3) Spoon sauce over chicken. 4) Add lid and cook on “low” setting for 3-6 hours or until the chicken shreds easily. (The cooking time will depend on the size and strength of your slow cooker). 5) Shred chicken and return to slow cooker to mix with sauce. This slow cooker blackberry chicken tastes great served on a roll or plain with sides of broccoli and brown rice. My husband and I also like to eat the leftovers on top of a salad. Enjoy! I mean, yum. Right? For more deliciousness (and tons of DIY ideas) from Kelly, be sure to follow her on Facebook, Instagram and Pinterest. And don't forget to check out her cookbooks!